Put a little sparkle in her Easter basket this spring with beautifully selected jewelry from Tiny Blessings. We have specifically chosen designer and customer favorites that will be lasting treasures long after she receives them this Easter holiday. This one of a kind necklace is grouped with an adorable chic butterfly cut-out round pendant; personalize it with her elegant initial and Swarovski® crystal birthstone to make this necklace something truly special she will treasure always! All 26 initials and 12 Swarovski® crystal birthstone colors to chose from. (Ages listed for chain sizes are a standard approximation.) She will have fun with her look everyday when she can select just one, or two or all three pendants to wear and change up her style as quickly as a butterfly flits it's wings! It is difficult to find quality jewelry for children. Thankfully I found Tiny Blessings and this is my second purchase. I highly recommend this company and its jewelry. I bought this as a gift for my niece. 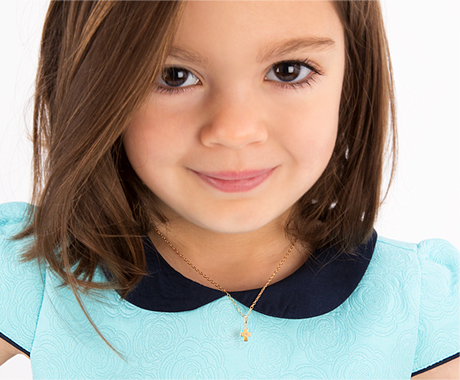 The necklace is beautiful and fun, yet elegant for a 7-year old. I really liked that it is a custom, unique gift that she can cherish for many years.